I have an unreasonable love of cables. Cables are, in fact, the reason that I started knitting. They're beautiful; so intricate, so full of texture, and yet so simple to execute. 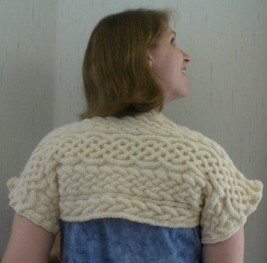 A shrug was the perfect way to indulge my passion for cables, as a simple rectangle with no shaping and only two short seams turned into something I could actually wear. This project was also a stashbuster: it took just two balls of wool-ease to complete!